The terrain of Nova Scotia is quite rocky and sandy with some quick elevation changes. Due to the last ice age pushing rock and sand into piles called Drumlins there are random hills with high elevations all over the place. The place we were was a causeway with beach on both sides with a road running along the length of the causeway. There were several parking lots and a couple of wooden beach buildings for changing, bathrooms etc. At the end of the causeway there was a Drumlin with a row of houses along the crest and where the drumlin met the water it had been eroded and revealed a scattering of large rocks. The Drumlin crest is at the top of the map. I would try to show this by having a steep elevation going up at least 4". In reality the areas marked by "A" were water but in the dry central deserts of Terra Nova they could just count as open terrain. The areas of beach "D" I would count as open difficult terrain to represent the difficulty of driving or moving over sand that shifts under you when you move. This would mostly affect ground vehicles as Hover vehicles are unaffected by difficult terrain with a height of 0". There is a road that runs the length of the causeway which has three parking lots "C" which provide vehicles for cover. 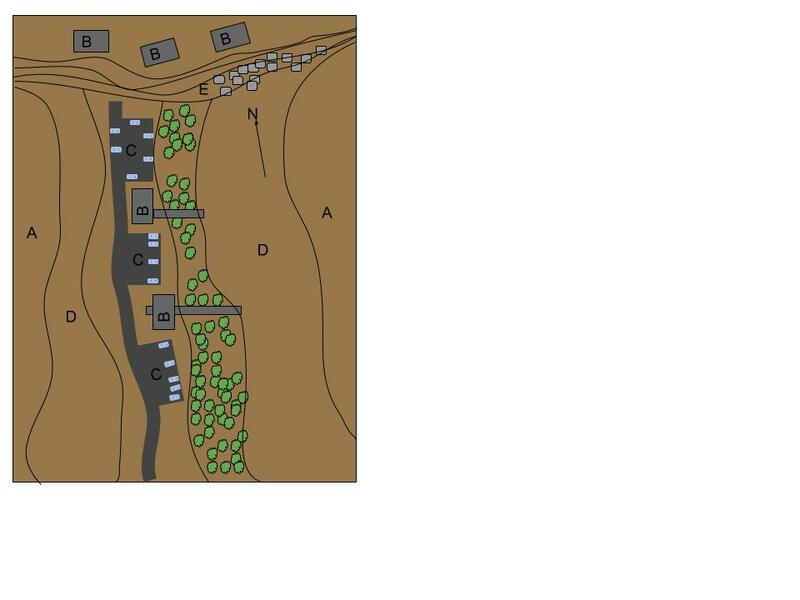 The light wooden buildings "B" would have a 2" height and the area of scrub forest between the beach buildings and the beach would have a height of 1/2". The interesting part about this map would be the way that terrain is very open in the North/South axis but very congested in the East/West axis with control of the height of the causeway and the Drumlin. Often when gamers play Heavy Gear, or any miniatures game set on a planet, we have a bare flat board and then add terrain in discrete sections. This approach can provide for an interesting scenario but every table starts feeling the same. In the approach I showed above the table is defined by a specific feature, the causeway, and the bracketing beaches. To build such a table would not be difficult. Some plastic 144th scale buildings from a modeling supply shop, black or grey painted cardboard for the roads. A bag or two of lichen for the shrubs. I would build the vertical shape of the board with books and then cover the whole thing with a brown sheet or table cloth. Some rocks or gravel for the rocks and you are ready to play. Besides the fun of a game with friends building such a map can be excellent for building on the memories of a holiday.